I have implemented a feature for inspectrum, a tool similar to baudline but it holds much more promise (I don’t think baudline is still being developed, and the source code is not available). It is still in the early stages, but it can already be used to investigate radio signals. If you want to show a spectrogram, there is a trade-off you can make between time resolution and frequency resolution. This is achieved by changing the window function of the fft. You can see the result in the next images. The fft window is wide, resulting in good frequency resolution (see the unmodulated part of the signal), but bad time resolution (you cannot see what is happening in the modulated part). 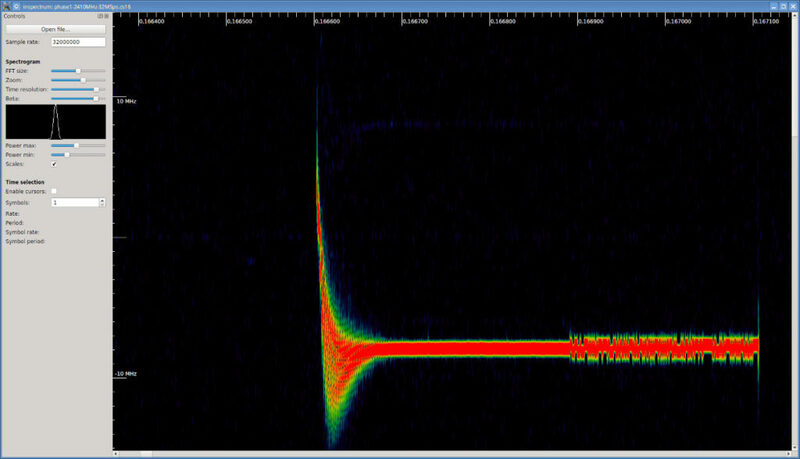 The fft window is narrow, resulting in bad frequency resolution (see the unmodulated part of the signal), but good time resolution (you can see the frequency shift keying modulation). My version adds the time resolution and beta sliders. The beta parameter is a parameter of the kaiser window I used. 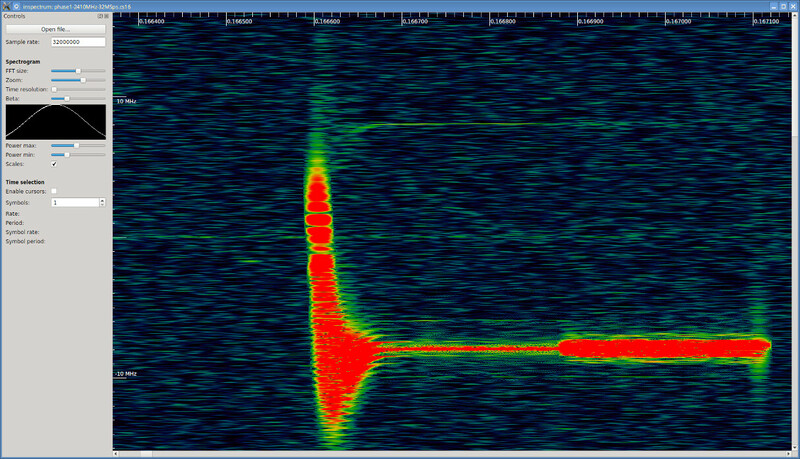 Together, they allow you to fine-tune how the spectrogram displays the signal very nicely. The window shape can be seen in the widget below the two sliders. Hopefully the changes will soon be merged into the main inspectrum branch. Until then, it can be found here. In case you are wondering: the signal is a frame sent by a remote control of a miniature drone. As the transmitter is turned on, you see that the frequency needs to stabilize first. Then the signal starts to shift between two frequencies, sending the data at about 1mbps. The data is captured with a USRP B200 at 32msps in the 2.4GHz band. This entry was posted in DSP, FOSS, github on May 7, 2017 by hansvi.